This page compares humidity logger vs Temperature logger and mentions difference between Humidity logger and Temperature logger. Following table-1 lists out generic technical specifications of Humidity logger device (capacitive type). The device is developed by Testo India Pvt. Ltd. Refer humidity sensor➤ for more information. Following table-2 lists out generic technical specifications of temperature logger device (NTC type). 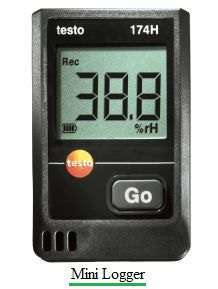 The device is developed by Testo India Pvt. Ltd. Refer temperature sensor➤ for more information.